2. 12. 18 - WRWS/FN - Berlin: Parlamentskreis Pferd gegründet. Diskussion und Information über das Thema Pferd. Auf Initiative der Bundestagsabgeordneten Alois Gerig (CDU), Pascal Kober (FDP), Andrea Nahles (SPD) und Dieter Stier (CDU) hat sich in Berlin der Parlamentskreis Pferd gegründet. Zur Gründungsveranstaltung, zu der auch die Deutsche Reiterliche Vereinigung (FN) mit ihrer spitzenverbandlichen Expertise eingeladen war, kamen zahlreiche Abgeordnete unterschiedlicher Fraktionen, darunter Bundesverteidigungsministerin Ursula von der Leyen (CDU). Gesagt, getan – was Politikern oftmals abgesprochen wird, widerlegt eindeutig die Gründung des Parlamentskreises Pferd. Bereits im März 2018 hatte Alois Gerig, Vorsitzender des Bundestags-Ausschusses für Ernährung und Landwirtschaft, im Rahmen des Parlamentarischen Abends der FN erklärt, dass das Thema Pferd im Parlament mehr Aufmerksamkeit verdiene. Dieter Stier, stellvertretender Vorsitzender des Bundestags-Sportausschusses, und Pascal Kober, der die Federführung übernahm, kündigten im Rahmen der FN-Präsidiumssitzung an, einen Parlamentskreis Pferd aus der Taufe heben zu wollen. Dieser Ankündigung ließen die eng mit dem Pferd verbundenen Abgeordneten zusammen mit Andrea Nahles, der Parlamentskollegin gleichen Interesses, nur wenige Monate später Taten folgen. Fast 40 Bundestagsabgeordnete der Fraktionen CDU, SPD, FDP und Grüne stehen bereits auf der Interessentenliste des Parlamentskreises – Tendenz steigend. Fast vier Millionen Menschen in Deutschland bezeichnen sich selbst als Reiter und rund 1,3 Millionen Pferde leben in der Bundesrepublik. Knapp 700.000 Mitglieder sind in den 7.521 Reit- und Fahrvereinen unter dem Dach der FN organisiert. Die Deutsche Reiterliche Vereinigung zählt damit zu den acht größten Verbänden des Deutschen Olympischen Sportbundes (DOSB). Auch als Wirtschaftsfaktor ist das Pferd nicht zu unterschätzen: Der Umsatz der deutschen Pferdewirtschaft liegt bei geschätzten 6,7 Milliarden Euro. Darunter fallen 39 Prozent (2,6 Mrd. Euro) der Ausgaben auf den Bereich Pferdehaltung, 61 Prozent (4,1 Mrd. Euro) auf den Bereich Einzelhandel und Dienstleistungen. „Dass der Umgang mit Pferden viele positive Einflüsse auf uns Menschen hat, das erleben wir als Reiter, Fahrer, Voltigierer oder Züchter fast jeden Tag. In unserer zunehmend digitalen und automatisierten Welt bekommt der persönliche Bezug zum Tier eine ganz neue Dimension. Das Pferd ist von unschätzbarem Wert im zivilgesellschaftlichen Miteinander sowie als Wirtschaftsfaktor. Umso mehr freut es uns, dass das Thema Pferd auf der Ebene des Bundestags angekommen ist und durch den Parlamentskreis eine so große Unterstützung erhält. Diskussionen über Tierschutz und -zucht, die Pferdesteuer oder Kutschen im Straßenverkehr erreichen immer wieder eine politische Dimension. Das zeigt uns, wie wichtig und fruchtbar es ist, unsere Argumente pro Pferd in den unterschiedlichen Politikbereichen in Berlin zu platzieren und aktiv mitzugestalten“, sagte Bernhard Feßler, Leiter des vor gut einem Jahr eröffneten Hauptstadtbüros der FN. Er vertrat die FN auch bei der Gründungsveranstaltung des Parlamentskreises. 2. 12. 18 - WRWS/NRHA - - Cool As Ice – Fappani Wins 2018 „NRHA Cinch Non-Pro Futurity”. The competition in the 2018 National Reining Horse Association (NRHA) Cinch Non Pro Futurity was hot, but Tish Fappani kept her cool despite a three-way runoff for the championship. Fappani claimed her third Level (L) 4 Non Pro Championship tonight aboard „Icecube“, a red dun stallion by SG Frozen Enterprize and out of Taris Designer Genes, nominated by Andrea Fappani and owned by Andrea and Tish Fappani. Earning the title of 2018 NRHA Cinch Non Pro L4 Reserve Co-Champion and L3 Champion was Samantha Smith and Neverthoughtiwould (NRHA Million Dollar Sire Pale Face Dunnit x Shine Tini) [video]. 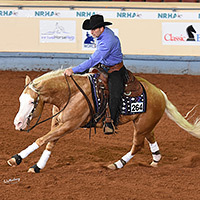 The cremello gelding is owned by NRHA Million Dollar Owner Lance Griffin and nominated by Ginger Schmersal. When asked about her run Smith said, “Going in the first time I knew there was a pretty big score to beat, but I just wanted to be good. My plan was to show smart because he is a fun horse but to be able to put the hammer down and show him clean and correct and it worked.” Smith gave credit to her trainer, Martin Larcombe and how prepared he had her horse for tonight. Madison Steed and Into The Nite claimed the Cinch Non Pro L4 Reserve Co-Championship and L2 Championship [video]. Into The Nite, nominated by Turnabout Farms, Inc. and owned by Steed, is by NRHA Two Million Dollar Sire Gunners Special Nite and out of Chexy Dun It. “My first run he was awesome. He turned better in there than I think he has in his entire life. We bobbled in the run in on the first one, but he is three and he tried super hard, and I really couldn’t have asked for a better horse,” said Steed when asked about her run. Wining the Cinch Non Pro L1 and Youth Championship as well as the L2 Reserve Championship was Sam Flarida riding Hollywooddirtysecret [video], a red dun gelding nominated by Patricia Duque and owned by Shawn Flarida. Daniele Whitney and Absolute Gunner slide their way to the Cinch Non Pro L1 Reserve Champion. Absolute Gunner, nominated by Turnabout Farm, Inc, is by NRHA Hall of Fame Inductee Gunner and out of Taris Modern Design. Cade McCutcheon and Alpha Brave Hard (nominated by Alpha Quarter Horses, Inc.) clinched the Non Pro Youth Reserve Championship. Alpha Brave Hard is by NRHA Two Million Dollar Sire Gunners Special Nite and out of Miss Brim Peppy. The Non Pro Prime Time Championship ended with a two-way tie between Think Im Gunna Shine ridden by Chad Clark [video] and Whata Special Nite ridden by Stoney Russell [video]. Think Im Gunna Shine (Nominated by Rick Sassella) is by NRHA Two Million Dollar Sire Gunnatrashya and out of Shiny Wrangler. “It was super fun and I love a horse that will let you show them like that. She is super sweet,” said Clark when talking about his winning run tonight. The 2018 NRHA Futurity continues its successful start with impressive and historic numbers. Non Pro entries were up 8% (629) in comparison to last year (582). This year’s edition had the largest purse (level 1 – level 4) in history with $617,166. The second largest was held in 2012 with $605,111. Additionally, the purse for each level was at a record high. 2. 12. 18 - WRWS/NRHA - - NRHA Open Futurity finalists are determined following the Level 4 Open Semifinal sponsored by Not Ruf At All and Tamarack Ranch. Each year in Oklahoma City, Oklahoma, the National Reining Horse Association (NRHA) Futurity & Adequan® North American Affiliate Championship (NAAC) Show features the world’s most elite competitors in the sport of reining. To highlight this talent, last year NRHA created a new event, thrilling for both spectators and reiners alike; the Level (L)4 Open Semifinal. The NRHA Futurity Level 4 Open Semifinal sponsored by Not Ruf At All and Tamarack Ranch included the top 75 horses (plus ties) in the L4 Open division from the first go-round. Those achieving the highest combined score from the first go-round and semifinals advance to the finals and compete head-to-head for the winner’s $150,000 guaranteed paycheck on the night of Saturday, December 1. This year’s L4-L1 purse is the second largest in NRHA history, making the achievement even more special. Additionally, those riders qualifying for the semifinal, but not marking high enough to advance to the final, will receive a paycheck of more than $1,600 for their effort. The L4 Open Semifinal was packed with high scores, but at the end of the day it was NRHA Million Dollar Rider Casey Deary and Gunnarickashay [video] who added a 225 to their 224 go-round score to win the L4 composite. Their 449 edged out Austin Lee Roush and Gunna Stop by one-half point for the win. 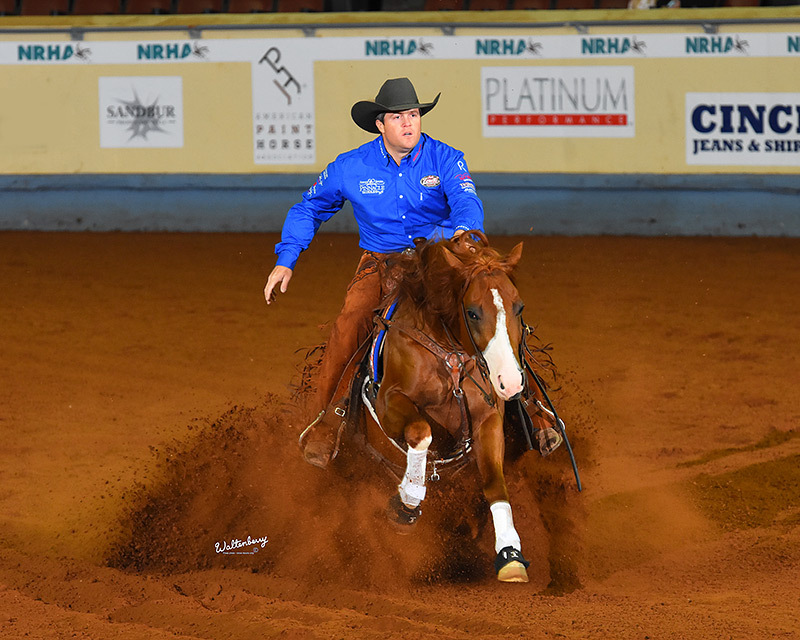 Earlier this year, Deary and Gunnarickashay won the All American Quarter Horse Congress L4 Open Reserve Championship to bring the stallion’s earnings to over $23,000. The son of NRHA Million Dollar Sire Gunnatrashya is out of Rondas Tio, a mare that has produced winners of more then $215,000 including Heavy Duty Chex ($133,50 NRHA LTE). Gunnarickashay is owned by Judy and Jolan Puno and nominated by St-Onge Reining Horses, Inc.
Go-round winner Kole Price and Isnt She Perfect (NRHA Two Million Dollar Sire Walla Walla Whiz x Miss Silver Gun) [video] marked a 220½ to bring their composite score to 447½ and land them in the third place position. The gray mare is owned by Amy Medows and nominated by Tamarack Ranch, LLC. A composite score of 448½ rose to the top of the field in L3 through 1. Austin Lee Roush and Gunna Stop [video] marked a 227 in the semifinal for owner Alexandria Gokey. The chestnut stallion nominated by Toyon Ranch, LLC is by NRHA Million Dollar Sire Gunnatrashya and out of Stop Little Sister. So far this year, the duo has earned more than $6,500 at the HOT Summer Slide Futurity, Tulsa Reining Classic Futurity, and All American Quarter Horse Congress Futurity. With a composite score of 442½, Mike McEntire took top honors in the prime time open division riding Pale Face Whiz. 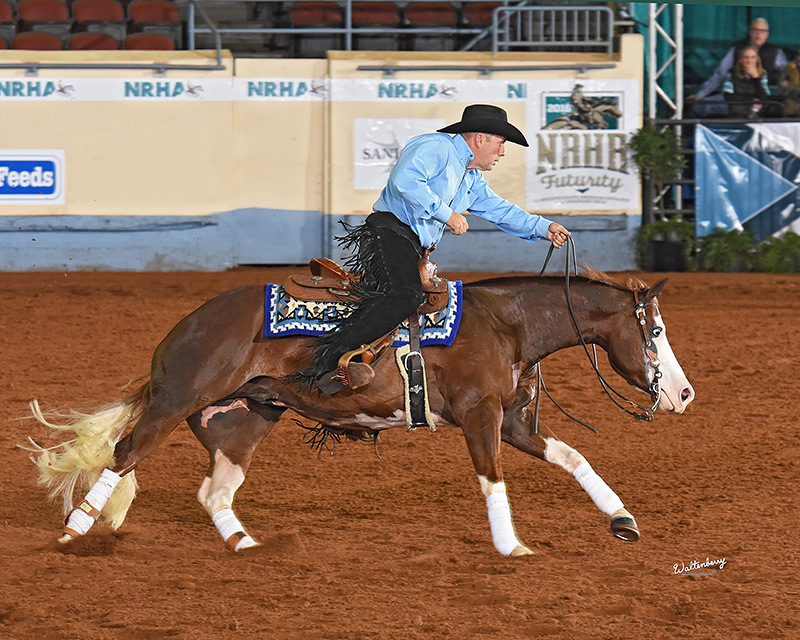 The dual-registered AQHA/APHA stallion owned by Everett and Karen Wiggins is already an NRHA money earner having won more than $6,000 at the All American Quarter Horse Congress Futurity with Craig Schmersal. The new semifinal format provides more recognition to NRHA owners and riders and showcases the incredibly talented equine athletes in the sport of reining. Additionally, a guaranteed payout was made to each horse that qualified for the semifinals. 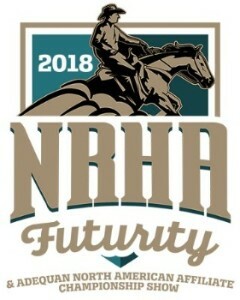 For more information on schedules, tickets, hotel accommodations, sponsors and more, visit nrhafuturity.com. 2. 12. 18 - WRWS/NRHA - - Schmidt and Gunna Cash Ya Lead Open Semifinal. Morgan and Tracy Tinseltown Win Non Pro Go-Round. As the 2018 National Reining Horse Association (NRHA) Futurity & Adequan® North American Affiliate Championship Show (NAAC) moved into the second week of competition, more talented reining horses entered the Jim Norick Arena at Oklahoma State Fair Park. “The Futurity” is the world’s most prestigious reining event open to 3-year-old horses. Today, the NRHA Open Futurity Level (L)1, 2, 3 Semifinals concluded its second section, and the CINCH NRHA Non Pro Futurity qualifying go-round ended, setting the stage for this weekend’s finals. In Monday’s first section of the semifinal, Joe Schmidt of Pilot Point, Texas rode Allison Sutton’s Gunna Cash Ya (Lil Joe Cash x Gunners Blonde Chic) to a 222 [video]. The semifinal effort gave the pair a 438 composite to lead the L3-L1 divisions. Just one-half point behind in the composite is Smokin Paleface and Brent Naylor of Phoenix, Arizona. On Monday, they slid their way to a 221½ [video] to bring their composite score to 437½ . Owned and nominated by Tim Anderson, the sorrel stallion is by NRHA Million Dollar Sire Pale Face Dunnit and out of Lost In Tinseltown. NRHA Markel Futurity Sales Graduate Off N Running took to the arena in the second section of the semifinal with Austin Lee Roush of South Bend, Indiana. The duo marked a 216 ½ to move up the leaderboard for owner Matt Roush and nominator Arcese Quarter Horses USA. The sorrel stallion sits third in the L3 and L2 and second in the L1 division with a composite score of 435½. In the Prime Time Open division, it’s all about the ladies with Shauna Larcombe and Ann Salmon Anderman taking the top spots. Larcombe leads the division for riders 50 and older with a 430½ composite score on NRHA Million Dollar Owner Rosanne Sternberg’s Lil Ruf Spook (Smart Spook x Lil Ruf Muffin). Anderman and John McCarroll’s Tinseltown Joe (Hollywoodstinseltown x Joe Cat Jac) are right behind with a 430 composite score. The qualifying continues tomorrow with the Level 4 Open Semifinal sponsored by Not Ruf At All and Tamarack Ranch. The top 75 horses (plus ties) in the L4 Open division will vie for their chance at the second largest purse in NRHA Futurity history ($1.5 million estimated). Those horses qualifying for only the Level 3 and/or Level 2 and/or Level 1 Open divisions will show in the first section. The remaining qualifiers (Level 4 Open and Level 4 Open/Level 3 Open/Level 2 Open/Level 1 Open divisions) will compete in the second section. The finals in each division will be a clean-slate format. 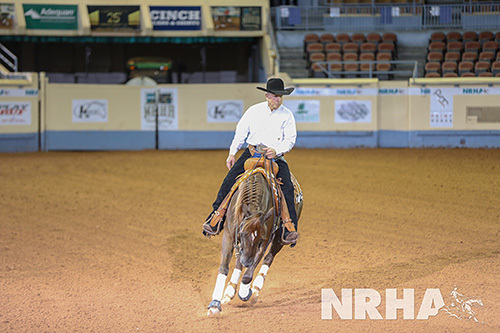 After 202 horse and rider teams took to the arena to qualify for the CINCH Non Pro Futurity Finals, the richest in the event’s history, one pair remained at the top of the leaderboard: NRHA Million Dollar Rider James Morgan, DVM and Tracy Tinseltown [video]. They marked a 219½ in the first section to set the bar. Dr. Morgan purchased Tracy Tinseltown (by Hollywoodstinseltown and out of Smart Scooter Chic) as a 2-year-old. She is nominated by Tracy Higginbottom. The pair also lead the prime time division. The second-highest score in the go-round and highest in the youth division was posted by Cade McCutcheon and Alpha Brave Hard (Gunners Special Nite x Miss Brim Peppy) owned by Tom and Mandy McCutcheon. Together the duo marked a 219 [video]. Alpha Brave Hard is nominated by Alpha Quarter Horses LLC. In the L3 division, Samantha Smith and Neverthoughtiwould held onto the top position with a 218 ½ [video]. Neverthoughtiwould, by NRHA Million Dollar Sire Pale Face Dunnit and out of Shine Tini, is nominated by Ginger Schmersal and owned by Lance Griffin. The leaderboard changed in the L2 and L1 divisions with two entries earning a 217 ½: George Lawrence aboard Time For The Gunshow and Daniele Whitney riding Absolute Gunner. Lawrence Ranch owns Time For The Gunshow (nominated by Kindra Rader), a stallion by NRHA Two Million Dollar Sire Gunners Special Nite and out of Timed To Shine. Absolute Gunner (nominated by Turnabout Farm, Inc.) is a son of NRHA Hall of Fame Sire Gunner and Taris Modern Design. 1. 12. 18 - WRWS/NRHA - - 2018 NRHA Futurity in Full Swing. The Jim Norick arena saw open and non pro competitors today at the 2018 National Reining Horse Association (NRHA) Futurity. The day started off with the second go-round, section one of the Open Futurity, which saw 50 horse and rider combinations. The CINCH Non Pro Futurity wrapped up the day with section two of the go-round. Joe Schmidt rode Gunna Cash Ya (Lil Joe Cash x Gunners Blonde Chic) for owner and nominator Allison Sutton to a 222, which gave the pair the highest score in the open section [video]. After marking a 216 in the first go-round, that left them with a composite score of 438. Smokin Paleface and Brent Naylor slid their way to a 221 ½ [video]. Owned and nominated by Tim Anderson, the sorrel stallion is by NRHA Million Dollar Sire Pale Face Dunnit and out of Lost In Tinseltown. They ended the go-rounds with a composite score of 437 ½ after earning a 216 earlier in the week. With only four horses left, Jesse Beckley and Holly Gun gave it their best shot and marked a 216 to be added to their first go-round score of 217 for a composite score of 433 ½ [video]. Holly Gun, owned and nominated by Kar K2 Ranch Partnership, is by NRHA Ten Million Dollar Sire Gunner and out of Docs Dunnit Bar. The second section of the non pro featured a total of 48 runs. Among some tough competition, Samantha Smith and Neverthoughtiwould marked the top score of the day [video]. 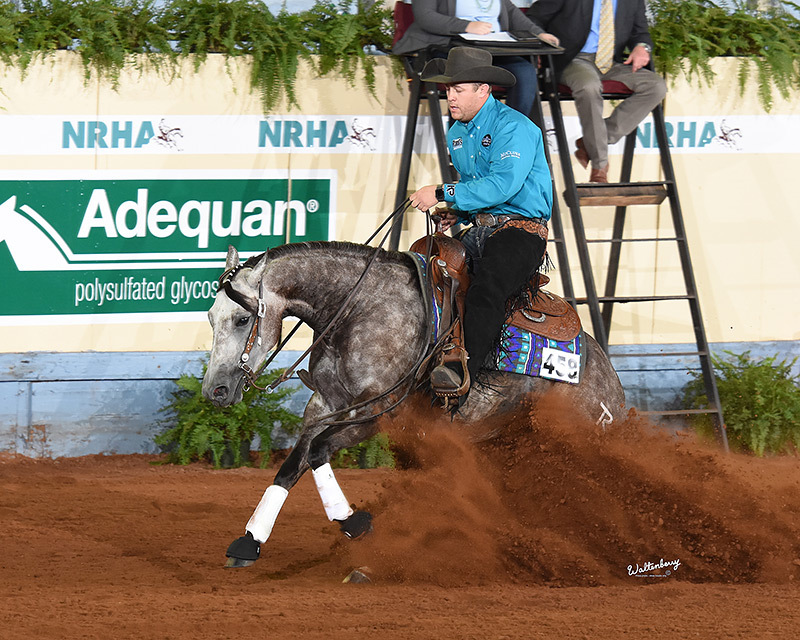 “He is one of the most fun horses I have ever had, and he is a great show horse,” Smith said. 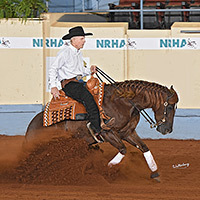 She went on to add, “I did have a turn penalty, so there is a little more room for improvement, but I just wanted to turn around and go back in there and do it again.” Neverthoughtiwould, by NRHA Million Dollar Sire Pale Face Dunnit and out of Shine Tini, is nominated by Ginger Schmersal and owned by Lance Griffin. 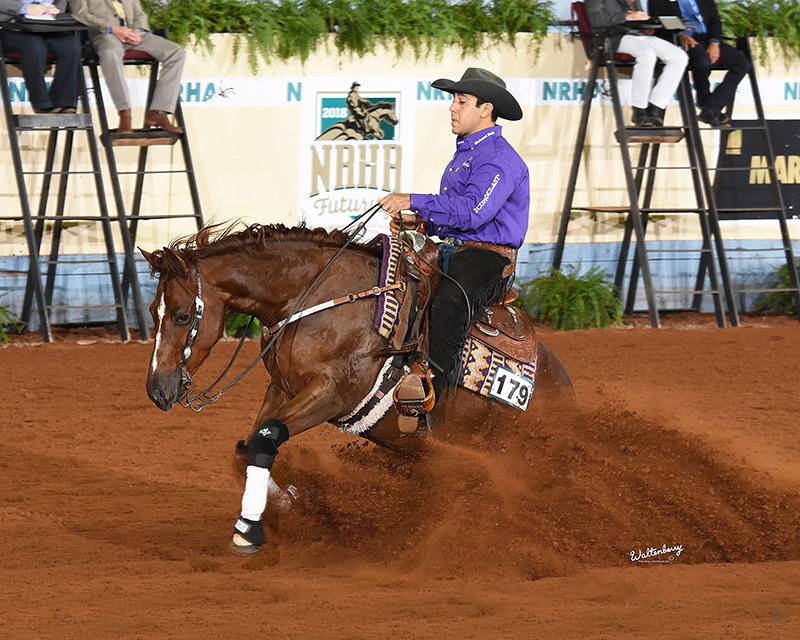 NRHA Million Dollar Rider and Owner Jose Vazquez rode SLJ Corazon Valiente to a 217 ½ [video]. The sorrel stallion, by Smart Like Juice and out of Wind Her Up Shiner, is owned and nominated by Smart Like Juice, Inc. Rounding out the top three scores of the day was Frank Ordner, III and Tinseltown Footprint (Gunners Tinseltown x Fabulous Footwork). Tinseltown Footprint is owned and nominated by David Silva, Sr. The 2018 NRHA Futurity continues its successful start with impressive and historic numbers. Non Pro entries are up 8% (629) in comparison to last year (582). This year’s edition has the largest purse (level 1 – level 4) in history with $617,166. The second largest was held in 2012 with $605,111. Additionally, the purse for each level of the is at a record high. 1. 12. 18 - WRWS/DQHA - DQHA Horsemanship Camps 2019: Die Termine stehen fest! DQHA Züchterforum, Mitgliederversammlung und Ball - 22. – 24. Februar 2019 in Offenbach. 28. 11. 18 - WRWS (hpv) - Reining: Julia Schumacher verlässt den LQH-Turnierstall in Bitz. Julia Schumacher, in Spaichingen (Landkreis Tuttlingen) geboren, hat den Turnier- und Ausbildungsstall Ludwig Quarter Horses (LQH) in Bitz verlassen. Die 32-Jährige, zurzeit auf einer Urlaubsreise in Bali, wird sich auf der „Schnyder-Ranch“ in Ravensburg selbstständig machen. Julia Schumacher auf „Cœurs Little Tyke“ (© Lux-Company)Die mit der bronzenen Mannschafts-WM-Medaille (2018) in Tryon (USA) sowie der silbernen- und bronzenen Plakette 2017 bei den Europa­meister­schaften in Givrins (SUI) ausgezeichnete Amazone, sagte LQH ade. „Ich habe im Mai/Juni mit Sylvia Maile und Grischa Ludwig darüber gesprochen, dass ich mich verändern möchte, um einen weiteren Schritt nach vorne zu machen. Jetzt hat es sich kurzfristig ergeben, dass ich mich selbstständig machen kann“, erklärte die erfolgreiche Reiterin. Julia Schumacher reitet seit ihrem sechsten Lebensjahr, besuchte das Gymnasium in ihrer Geburtsstadt und schloss die Schulzeit mit der allgemeinen Hochschulreife ab. Bei der Kreissparkasse in Tuttlingen wurde sie zur Bankkauffrau in den Bereichen Kundenbetreuung- und Beratung, Geldanlage, Tätigkeiten im Backoffice-Bereich sowie als Urlaubsvertretung an Service- und Kassenstellen ausgebildet. Julia begann zunächst mit der klassischen Reitweise. Anfang 1995 konzentrierte sie sich auf das Springreiten (Klassen A/L) und war drei Jahre lang recht erfolgreich. Es folgte eine Turnierpause. Doch der Pferdebazillus hatte sie inzwischen infiziert. Sie frönte inzwischen dem Freizeitreiten und galoppierte mit ihrem Pferd über Stock und Stein durch das Gelände ihrer Heimatgemeinde. Danach war sie von Oktober 2002 bis Juni 2005 als Assistentin in einem Pferdeausbildungs- und Pensionsstall engagiert. Anschließend sattelte die Springreiterin um. Sie stieg vom leichten Sattel in den schwereren, aber gemütlicheren Westernsattel um. 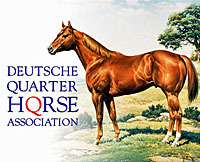 Bei einem Praktikum auf dem Hof von „Breug Quarter Horses“ in Reichweiler besorgte sie die Pflege und das Training der Pferde. Doch zunächst einmal stand für die damals 21-Jährige fest, dass sie eine Ausbildung zur Bankkauffrau hinter sich bringen wollte. Nachdem Julia ihre Ausbildung – mit bestandener Prüfung – beendet hatte, wurde sie Co-Trainerin bei „Steck Reininghorses“ in Buch-Rennertshofen. Von August 2010 bis zum Oktober des folgenden Jahres wechselte die Amazone als Co-Trainerin nach Prichsenstadt zu „La Mesa Performancehorses“, wo das Training und die Pflege der Jung- und Turnierpferde, die Vorbereitung der Turniere sowie die Vorstellung der Kunden-Pferde zu ihren Aufgabengebieten zählten. Die folgende Station war danach für Julia Schumacher der Schwantelhof bei Ludwig Quarter Horses (LQH) in Bitz, wo sie als Co-Trainerin angestellt wurde. „Ich habe mich in der Gemeinschaft auf dem Gutshof sehr wohlgefühlt. Außerdem habe einiges dazugelernt. Es war eine sehr schöne Zeit auf der Hochalb“, erklärt Julia Schumacher. 27. 11. 18 - WRWS (hpv) - Reining: Ein Dankeschön für Mäzenin Madeleine Winter-Schulze. Die deutsche Reining-Equipe der FEI-Weltmeisterschaften in Tryon bedankte sich auf dem Championats-Ball in Warendorf bei der großen Mäzenin und Sponsorin Madeleine Winter-Schulze für ihr Arrangement und die finanzielle Unterstützung mit einer Bronzestatue. Madeleine Schulze-Winter konnte die Statue jedoch nicht persönlich in Empfang nehmen. Nach einem Oberschenkelhalsbruch auf der WM in Tryon ist noch Schonung angesagt. Die frühere deutsche Meisterin in Dressur und Springen musste die vorzeitige Rückreise von den Weltreiterspielen nach Deutschland antreten. Mit einem Firmenjet des Unternehmens AGCO (Chairman Martin Richenhagen) wurde die 77-Jährige nonstop nach Hannover geflogen. Die Mäzenin und Besitzerin vieler Spitzenpferde von Ludger Beerbaum und der neuen Doppel-Weltmeisterin Isabell Werth wurde liegend in einem Bett geflogen. Den Rückflug für Madeleine Winter-Schulze organisierte ohne Kommentar und selbstlos Martin Richenhagen, Pferdemann, u. a. Equipechef der deutschen Dressur-Equipe in Hongkong (2008) bei den Olympischen Reiterspielen und Präsident des weltweit agierenden Landmaschinen-Unternehmens AGCO. In Tryon weilte er privat als Zuschauer. 26. 11. 18 - WRWS/NRHA - 2018 NRHA Non-Pro-Futurity läuft. Today marked the first day of the 2018 National Reining Horses Association (NRHA) Non Pro Futurity. 99 horses competed in the first section, and riders represented seven different countries. After the last rider left the arena, NRHA Million Dollar Rider Dr. James Morgan, DVM held the highest score with a 219 ½ on Tracy Tinseltown [video]. Dr. Morgan had this to say about his run, “I broke my leg about three months ago, so when I did that, I took the horse to Brian [Bell] and let him ride. So, he is a part of it, and I always want to give him credit.” He went on to add, “All her buttons were working today. She has a lot of buttons, and she is a bit of an overachiever.” He purchased Tracy Tinseltown (by Hollywoodstinseltown and out of Smart Scooter Chic) as a 2-year-old, and she is nominated by Tracy Higginbottom. The second-highest score went to Cade McCutcheon and Alpha Brave Hard (Gunners Special Nite x Miss Brim Peppy) owned by Tom and Mandy McCutcheon. Together the duo marked a 219. “He was really good. I messed up my left turn a little bit and had a penalty, but his right turn was really good. After that he was really easy and real honest,” said McCutcheon. Alpha Brave Hard is nominated by Alpha Quarter Horses LLC. 2018 NRHA Futurity - Dr James Morgan - Tracy Tinseltown - Non Pro Futurity first section - 219 1/2 from NRHA on Vimeo. Earning the third-highest score of the day was Kim Muehlstaetter and Spooks Diamond Rio (Spooks Gotta Whiz x Shiney Diamond Lady). The combo slid their way to a 218 in the Jim Norick coliseum today. Spooks Diamond Rio is nominated by Bobby Lewis. 26. 11. 18 - WRWS/FN - Pferdesportler feiern die Erfolge 2018. Rund 800 Gäste beim Championats-Ball in Warendorf. Der große Championats-Ball in der Springhalle des Deutschen Olympiade-Komitees für Reiterei (DOKR) war auch in diesem Jahr wieder der krönende Abschluss einer erfolgreichen Saison. „Unsere Teams haben in diesem Jahr 68 Medaillen bei Europa- und Weltmeisterschaften gewonnen, davon allein 48, die unsere Jugend errungen hat. Ich glaube, das hat es noch nie gegeben“, sagte Breido Graf zu Rantzau, Präsident der Deutschen Reiterlichen Vereinigung (FN), in seiner Begrüßungsrede vor den rund 800 Gästen aus allen Bereichen des Pferdesports. Ehrengast der Veranstaltung war in diesem Jahr Ursula von der Leyen. Stellvertretend für alle Pferdesportsoldaten bedankte sich der WM-Vierte im Voltigieren, Jannis Drewell aus Gütersloh, bei der Bundesverteidigungsministerin für die Möglichkeiten, die ihnen durch die Bundeswehr geboten wird. „Ich bin unglaublich stolz auf euch. Ihr seid nicht nur fantastische Botschafter für unser Land, sondern auch für die Bundeswehr“, entgegnete von der Leyen. Wie in jedem Jahr gab es zahlreiche Ehrungen für die erfolgreichen Championatsteilnehmer und die Sponsoren. Durch den Abend führte wie schon in den Vorjahren Peter Großmann, Sport-Moderator im ARD-Morgenmagazin. Die höchste Auszeichnung in diesem Jahr – das FN-Ehrenzeichen in Gold mit Lorbeer – wurde gleich zweimal vergeben: an die Weltmeisterin der Springreiter, Simone Blum (Zolling) sowie die Doppeleuropameisterin der U21-Dressurreiter, Jil-Marielle Becks (Senden). Während Becks ihre Ehrung zusammen mit ihren Teamkolleginnen persönlich in Empfang nahm, war Simone Blum der Veranstaltung nur per Videobotschaft zugeschaltet. Die Weltmeisterin startete nämlich zeitgleich bei ihrem „Hausturnier“ in München und konnte daher nicht beim Ball in Warendorf dabei sein. FN-Ehrenzeichen in Gold: Chiara Congia aus Offenbach (Weltreiterspiele Voltigieren Team NORKA des VV Köln-Dünnwald Mannschaftswertung Gold), Jannik Heiland aus Wulfsen (Weltreiterspiele Voltigieren Einzelwertung Silber), Lisa-Maria Klössinger aus Aicha vorm Wald (Europameisterschaft Dressur U25 Mannschaftswertung Gold, Einzelwertung 4. Platz, Kür Bronze); Alexandra Knauf aus Köln (Weltcupfinale Voltigieren Longenführer), Regine Mispelkamp aus Geldern (Weltreiterspiele Para-Equestrian Mannschaftswertung Bronze, Einzelwertung Bronze, Kür 4. Platz), Lara Schmitt aus Mönchengladbach (Weltreiterspiele Voltigieren Team NORKA des VV Köln-Dünnwald Mannschaftswertung Gold). FN-Ehrenzeichen in Silber: Jannis Drewell aus Gütersloh (Weltreiterspiele Voltigieren Einzelwertung 4. Platz), Johannes Kay aus Neuss (Weltreiterspiele Voltigieren Pas de Deux Bronze, Sarah Kay aus Münster (Weltreiterspiele Voltigieren Einzelwertung 4. Platz), Laura Klaphake aus Mühlen-Steinfeld (Weltreiterspiele Springen Mannschaftswertung Bronze, Einzelwertung 14. Platz), Alexandra Röder aus St. Augustin (Weltmeisterschaft Para-Fahrer Mannschaftswertung Silber, Einzelwertung Silber), Barbara Rosiny aus Lüneburg (Weltreiterspiele Voltigieren Longenführer), Dorothee Schneider aus Framersheim (Weltcupfinale Dressur 5. Platz), Robin Schoeller aus Bloomingburg OH/USA (Weltreiterspiele Reining Mannschaftswertung Bronze, Einzelwertung 33. Platz), Julia Schumacher aus Bitz (Weltreiterspiele Reining Mannschaftswertung Bronze, Einzelwertung 22. Platz), Markus Süchting aus Steyerberg (Weltreiterspiele Reining Mannschaftswertung Bronze, Einzelwertung 16. Platz), Maurice Tebbel aus Emsbüren (Weltreiterspiele Springen Mannschaftswertung Bronze, Einzelwertung 44. Platz), Rainer Vriesen aus Steinfurt (Weltmeisterschaft Para-Fahrer Equipechef). FN-Ehrenzeichen Junioren: Celine Beisel aus Beerfelden (Europameisterschaft Junioren Reining Mannschaftswertung Gold), Nea-Renée Bonneß aus Beelitz (Europameisterschaft Junioren Fahrer Mannschaftswertung Gold, Einzelwertung Silber), Mareike Dieter aus Leonberg (Europameisterschaft Voltigieren Juniorenteam Mannschaftswertung Gold), Franziska Engel aus Hauenstein (Europameisterschaft Junioren Reining Mannschaftswertung Gold), Lars Hansen aus Braunschweig (Europameisterschaft Voltigieren Longenführer), Mick Haunhorst aus Hagen (Europameisterschaft Children Springen Mannschaftswertung Gold, Einzelwertung 14. Platz), Charlotte Höing aus Großbeeren (Europameisterschaft Children Springen Mannschaftswertung Gold), Ronja Kähler aus Stahnsdorf (Europameisterschaft Voltigieren Junioren Pas de Deux Gold), Gregor Klehe aus München (Europameisterschaft Voltigieren Junioren Einzelwertung Gold), Julian Kögl aus Blankenfelde-Mahlow (Europameisterschaft Voltigieren Junioren Pas de Deux Gold), Henry Munsberg aus Osnabrück (Europameisterschaft Children Springen Mannschaftswertung Gold, Einzelwertung Bronze), Fabienne Nitkowski aus Hamminkeln (Europameisterschaft Voltigieren Junioren Einzelwertung Gold), Gina Mel Opitz aus Isselburg (Europameisterschaft Junioren Reining Mannschaftswertung Gold), Chiara Reyer aus Westerkappeln (Europameisterschaft Children Springen Mannschaftswertung Gold, Einzelwertung Silber), Mikka Roth aus Freimersheim (Europameisterschaft Children Springen Mannschaftswertung Gold, Einzelwertung 14. Platz), Lea Schröder aus Sehnde (Europameisterschaft Junioren Fahrer Einzelwertung Gold), Fokko Straßner aus Burgdorf (Europameisterschaft Junge Fahrer Mannschaftswertung Gold, Einzelwertung Gold), Moritz Treffinger aus Oberderingen (Europameisterschaft Pony Dressur Mannschaftswertung Gold, Einzelwertung Gold, Kür Gold), Lea Voskort aus Emsdetten (Europameisterschaft Children Fahrer Mannschaftswertung Gold, Einzelwertung Silber), Alexa Westendarp aus Wallenhorst (Europameisterschaft Junge Reiter Dressur Mannschaftswertung Gold, Einzelwertung und Kür 6. Platz), André Wellmann aus Leverkusen (Europameisterschaft Junioren Reining Equipechef), Georgia Wilk aus Göppingen (Europameisterschaft Junioren Reining Mannschaftswertung Gold). Als Dank für Ihr Engagement im Pferdesport erhalten Vetoquinol mit der Marke Equistro und Boehringer Ingelheim die Sponsorenplakette. Die Sponsorenplakette Dressur geht an Elke und Wolfgang Schmitz-Heinen aus Wermelskirchen. Die Sponsorenplakette Springen wird verliehen an die Horst-Gebers-Stiftung aus Braunschweig, an Marion und Gerhard Müter aus Königslutter sowie an Roland Zanotelli aus Basel/SUI. Die Sponsorenplakette Para-Equestrian geht an Anna Nolte aus Dreieich. Weiterhin wird die Sponsorenplakette Reining verliehen an Thomas Till aus Leipzig. Die Sponsorenplakette Vielseitigkeit erhalten Henrike Paetz aus Walldorf und Stephan Daub aus Kraichtal stellvertretend für SAP. Es erhalten die Sponsorenplakette Fahren Claudia Lauterbach aus Dillenburg sowie Sonja Scharf aus Neu-Isenburg. Die Sponsorenplakette Voltigieren wird verliehen an Patric Looser aus Köln und Barbara Rosiny aus Lüneburg. Das Graf-Rothkirch-Stipendium zur Unterstützung junger Vielseitigkeitsreiter erhalten Brandon Schäfer-Gehrau aus Düsseldorf und Calvin Böckmann aus Lastrup.